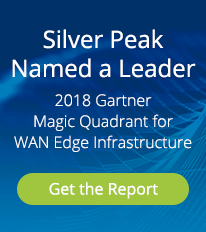 IT organizations around the globe choose Silver Peak WAN optimization to overcome network performance challenges and lower ongoing WAN costs. Virtual Flexibility. Silver Peak offers the industry’s only multi-gigabit virtual WAN optimization solution and is the only WAN optimization solution to run on every major hypervisor. The software is available for immediate download and free trial via the Silver Peak software marketplace. Industry-Leading. Silver Peak continues to lead the industry in WAN optimization capacity and performance. With the broadest portfolio of physical and virtual WAN optimization products, and support for up to 10 gig WAN environments, Silver Peak delivers the most cost-effective WAN optimization for branch offices, data centers, and the cloud. Accelerate Any Application. Silver Peak’s WAN optimization products improve the performance of all enterprise and cloud applications, regardless of transport protocol or version. This is done all without the risk of corrupting data or altering application behavior. No plug-ins are required, which expedites deployment and saves both time and money. Cloud-Ready. Silver Peak VX virtual WAN optimization appliances can be deployed directly within Infrastructure as a Service (IaaS) offerings from Amazon Web Services (AWS), Microsoft Azure, and VMware vCloud Air. This allows enterprises to easily extend their WAN optimization deployment into the cloud. Silver Peak is ideal for cloud providers and cloud subscribers, alike. Protect 20x More Data over Your Existing Network. Deployable anytime, anywhere from software marketplace. Set it and forget it. Works on all applications without special configuration or software. Cost effective. High capacity virtual and physical devices = minimal investment cost. Future proofed. Optimize any application, regardless of version or transport protocol. Industry leading scalability. Multi Gbps throughput in a single virtual or physical device. Lower telco and cloud costs. Avoid or delay costly WAN bandwidth upgrades by eliminating over 95% of WAN traffic. Lower cloud costs by over 50% by reducing data being transferred. Move data quicker between data centers, branch offices, and remote locations. Improve the performance of centrally hosted storage and applications. Ensure the success of strategic IT projects that rely on the WAN, like data replication, data center consolidation, virtualization, cloud, and big data. Silver Peak founder and CTO David Hughes provides an overview of WAN optimization and Silver Peak, discussing the company's services and solutions for the enterprise. This data sheet highlights the features and capabilities of Silver Peak VX WAN optimization software. The software uses real-time optimization techniques to solve network quality, capacity and distance challenges, resulting in fast and reliable access to information anywhere in the world. Disaster recovery, data center consolidation, virtual desktops, unified communications, cloud computing – nearly every major IT initiative today depends on a high performing and reliable wide area network (WAN). Yet all too often, limited WAN bandwidth, long distances, and network congestion prevent these initiatives from succeeding. The Silver Peak Global Management System (GMS) is a powerful platform for the deployment, management, and monitoring of a Silver Peak enabled Wide Area Network (WAN). In addition to centralizing the administration of Silver Peak NX, VX and VRX appliances, GMS provides detailed visibility into all aspects of application delivery across a distributed enterprise, including application behavior, WAN performance (latency/loss), Quality of Service (QoS) policies, and bandwidth utilization. As associate director at Linklaters, David Bennett is responsible for the WAN and reports into the CIO as the head of (ISS) Information Systems and Strategy development. He shared a case study of the firm's recent WAN revamp with CIO.com Linklaters is one of the largest law firms in the world, operating in more than 30 locations in 23 countries, advising companies, financial institutions, and governments. The firm's 540 equity partners and 2,000 lawyers cover 18 core practice areas, including capital markets, competition and antitrust, tax, mergers and acquisitions, intellectual property and technology. Calculate your WAN’s effective throughput and optimization potential.